Is It Wise To Build A Wall? The Berlin Wall existed from 1961 to 1989. “During this period, around 5,000 people attempted to escape over the Wall, with an estimated death toll ranging from 136 to more than 200 in and around Berlin. 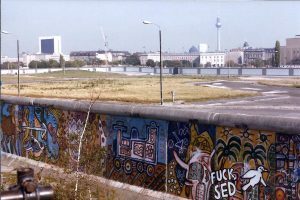 In practice, the Wall served to prevent the massive emigration and defection that had marked East Germany and the communist Eastern Bloc during the post-World War II period”- excerpts from Wikipedia. 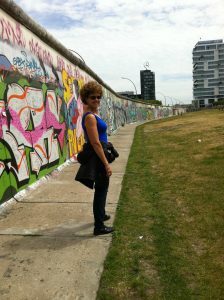 I personally saw the Berlin Wall twice-in 1979 and 1985. Each time I viewed it, I felt its negative energy. It divided people and caused much suffering because many families and friends were separated from each other. I value connecting people instead of dividing them. I also sensed the fear that was created by the visible guard towers and the machine guns poking out of the openings-armed and ready to kill anyone who attempted to cross the barrier. Donald Trump would like to build a wall between the United States and Mexico. The proposed cost varies but it is in the billions. There is an initial cost of construction and then there are the costs of maintaining this divider. The erection of massive concrete barriers didn’t seem to serve Germany well and was eventually demolished. I wonder if that money could be used in a more positive way? Might we look deeper to solve the root of the issues that prompted Trump to make this suggestion? Trump says that this will make us safer from illegal immigration and drugs. Will a wall really stop these issues? Might there be other ways for people and drugs to find their way into the United States? If the people within the US continue to want drugs, they will find a way to get them. Might it be prudent to look at the root of the drug problem for a more effective solution? If someone really wants to enter our country, they will find a way around the wall. There are many methods and points of entry. Can all the ways be controlled?